The programme includes the chance to hear from high profile speakers and take part with in-depth workshops and one-to-one coaching sessions from industry innovation experts. With the opportunity to pitch your product or idea to leading investors and seed funders, you will leave the event with new ideas, contacts and approaches for your business. 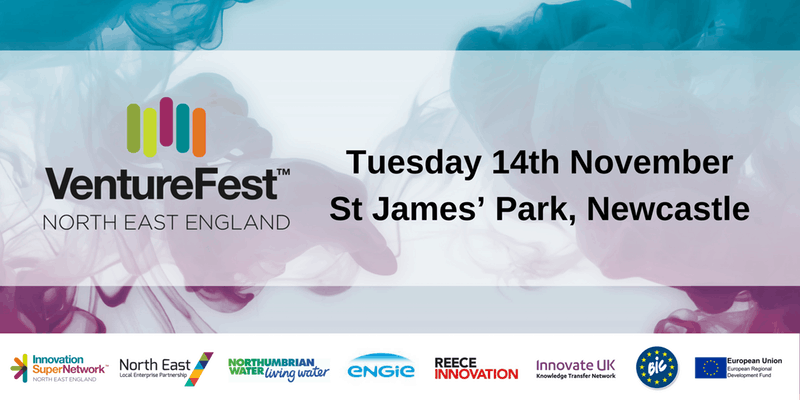 VentureFest North East is part of the Innovation SuperNetwork programme, which works with innovative businesses, investors and experts across the North East of England. It is supported by the North East LEP, Northumbrian Water, ENGIE, Reece Innovation, Innovate UK, the Knowledge Transfer Network and the North East BIC with part funding from the European Regional Development Fund, as well as support from around 50 partner organisations.